Nu Honours 1st Year admission release slip online application Information 2019 with results Available. 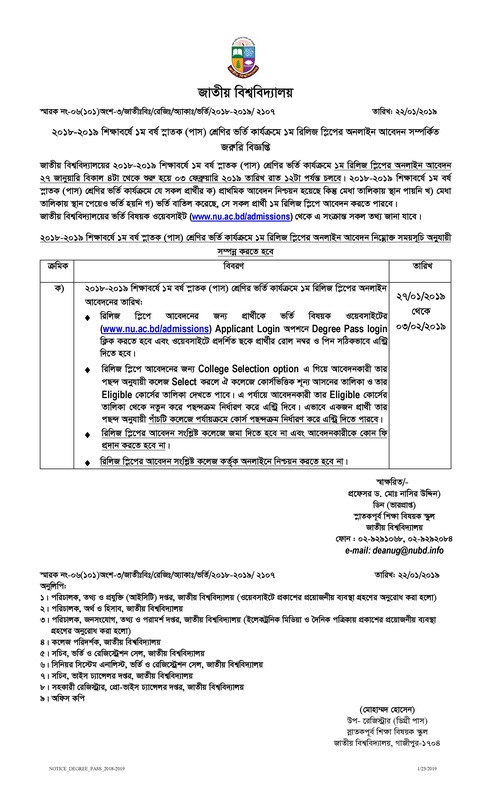 Bangladesh National University Gazipur Announce Admission Release Slip Related Urgent Notice For Nu Honours 1st Year (pass) Student). This Nu Authority published the Circular on 22 January 2019. Nu 1st Year Honours (2018-2019) Academic Release Slip application New circular has Been uploaded By The nu.edu.bd nu.ac.bd Authority. If you are an applicant for national University Admission 2018-2019 Academic year. Then Read our www.nu.ac.bd admission related post-Very Attention. Becuase. You will Learn” how to apply for Nu 1st year Admission. When you will apply to national university honours admission 2018-19.
Who will Apply on honours admission 1st release slip application? Every Student Cant apply on the Nu Admission home release slip 2019 online application. In The Field, Nu Gazipur members throw some condition for National University Admission 2018-19. See Below. A. primary nu admission application submit purely but The Student did not place in Marit list. B. Student Can’t Admission Nu College after chance in the Merit list. I hope You read The national university release slip circular related Educational Article. Honours admission release slip apply date and admission last date but Whose College student did not understand my Language, They are checking Last National University Gazipur Notice as Bangla Language as jpeg file below. How to apply Nu Honours admission release slip? National University 2018-2019 Academic year Honours 1st-year Admission first release slips Online apply will complete according to the roles and time. Type on Top Search ber “www.nu.ac.bd/admissions. Then Select your Favourite college from College Selection option for Nu release slip. Give your Nu Academic Couse name or Select. A student can Choose 5 Nu College. Do not submit To Nu College The Form fill up Release slip online application copy. The applicant does not have to pay any fee for Honours 1st release slip application.